Egyptian airstrikes killed 64 Islamic State (IS) militants, including three of their leaders, in Libya’s coastal cities of Derna and Sirte, Libyan army spokesperson Major Mohamed Hegazy told Ahram Arabic news website on Monday afternoon. In the early hours of Monday, the Egyptian army, in coordination with the Libyan army, carried out air strikes against IS targets in Libya, he said. The attacks followed the publication on Sunday of a graphic video allegedly showing IS militants beheading Egyptian Coptic Christians they had previously kidnapped. Hegazy denied allegations that the airstrikes had incurred civilian casualties. “Media outlets working for IS promote the notion of civilians being targeted in order to spark chaos and fear, and garner sympathy for members of the organisation,” he said. Libya-based social media users had posted a picture of three dead children claiming they died as a result of the Egyptian airstrikes. Earlier on Monday, Libyan Air Force Chief of Staff Saqr Al-Geroushi told Egyptian TV channel Al-Nahar that the Egyptian jet fighters had succeeded in destroying a training camp, weaponry, and a house containing anti-aircraft missiles belonging to IS. He called on Egypt to continue its offensive along with the Libyan army until Libya is free of IS. Al-Geroushi also told the Al-Arabiya TV channel earlier that the Egyptian air strikes took place in coordination with the Libyan army. 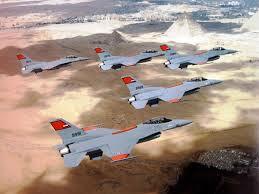 Meanwhile, Major Hegazy said that the Egyptian airstrikes had achieved their targets by 95 percent. Hegazy said that the F-16 and YF-15 fighter aircrafts used in the attack were precise, adding that the mission would continue until IS was destroyed. “Borders should not hinder any retaliatory strikes against these terrorist groups, and we do not reject any means of weakening such groups,” Haftar said.